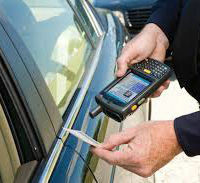 ATG's Access Mangement Software was developed for Window Mobile devices and scans 2D bar codes of driver licenses to validate (database) the person's access to the resource or location. Scan and access information is stored for future upload and report generation on the device or if WIFI/phone data package is available in real time mode. Validation can be performed against stored (Mobile device) database or in real time using the Mobile device WIFI/phone data package. ATG will customize the Access Management Software (Mobile device, Web Service, Reporting Tools, Database, and Administrative Software) in accordance with the customers needs. ATG implemented for Miami Dade County TRC (Trash and Recycling Centers) Access Management System to ensure that only waste fee customers deliver materials to the facilities. Residents are required to present a valid State of Florida driver license or Identification Card to the waste attendant on duty. The mobile device provides positive or negative feedback to the waste attendant to allow access of the center to the resident. The waste attendant records in the Access Management Software what materials are being dispose which provides additional information to the TRC management team.